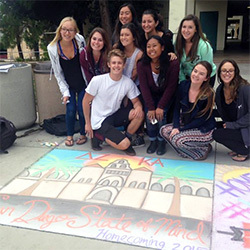 Cal Coast Open Air Theatre Walkway, 12 -2 p.m.
Showoff your SDSU Pride and artistic ability by chalking the sidewalk and creating a felt banner to support our team this homecoming week! 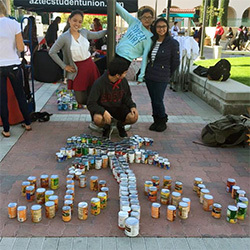 Conrad Prebys Aztec Student Union Courtyard, 12 - 2 p.m.
Give your engineering skills a go at the Can Build competition. Bring canned food and a team and create your own can-struction. The can-masterpiece will center around this year’s theme and SDSU pride. Trade in your lightly used tee shirts for a new and FREE Homecoming t-shirt, while supplies last. All traded in t-shirts will be donated to Embrace San Diego, a local non-profit organization. Conrad Prebys Aztec Student Union · Templo Mayor, 5:30 – 7:30 p.m. The theme of the night is entrepreneurship. Come hear from past and current students have worked to develop a personal brand and business. Learn how they got their start at SDSU and what their experiences have been thus far. Conrad Prebys Aztec Student Union Courtyard, 7 - 9 p.m.
SDSU definitely has talent, so come and check it out! We challenge you to incorporate the Homecoming theme and SDSU pride into your performance at the talent show. Farmers Market, 12 - 1 p.m. Think you know everything there is to know about State? Bring your team for a fun-filled, SDSU themed trivia night! There will be prizes and food. War Memorial at Aztec Green, 9:30 a.m. The memories of our SDSU fallen Aztecs will be honored at the 22nd Annual War Memorial wreath-laying ceremony on the Aztec Green. Pay tribute to those who made the ultimate sacrifice during our nation’s military conflicts. 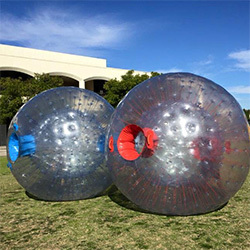 Conrad Prebys Aztec Student Union Steps, 6:30 p.m.
SDSU Sports Deck, 7 p.m.
Conrad Prebys Aztec Student Union Courtyard, 9 - 11 a.m., Check-in begins at 8 a.m.
Run alongside students, alumni, faculty and staff as you start and end at the Conrad Prebys Aztec Student Union. Following the run, enjoy free food, a photo booth, giveaways and more! Parma Payne Goodall Alumni Center, 9 - 11 a.m. Private event to honor the SDSU Homecoming Court. For inquiries, please contact leadership.programs@sdsu.edu. All alumni are invited to celebrate Homecoming with SDSU Alumni! Tickets are $25 per person until October 14, $30 afterwards, and include a one-time-through buffet and hosted beverages. For more information or to purchase tickets, visit sdsualumni.org/gat2018. The week culminates in the Homecoming Football game vs. the San Jose State Spartans. The game is set for 7:30 p.m. Aztecs are also invited to help welcome the team to the stadium for the traditional Warrior Walk between parking section E and F as the echo from Aztec drums signal the team’s arrival. For ticket information, visit the Tickets and Travel page.